1st Battalion at the Curragh 1908. The Pagent was held in Fulham Palace on 20th June, to raise funds for the Soldiers and Sailors Help Society. 1st Bn were in Ireland at this time so perhaps these men are from the depot at Perth? Pipes and drums on a North American tour, I think from the 70s. Press photograph from Columbia Artists. Full length portrait of an unidentified officer in levee dress circa 1900? Large size collar badges, Victorian crowns on SBP and WBC. There is a signature in pencil on the mount that i cant decipher? Also the mount is blind stamped with the logo of Lafayette Galleries the Royal photographers. 6th Bn marching through Woodhead 1911. Most of the children are barefoot. A nice photo, again it's the 6th! they do seem to dominate in the leftovers of what exists for the terrier battalions. Woodhead is in Ayrshire and the camp was nearly 4 miles south east of Kilmarnock. The exercise took the form of a sham fight against a force "landing at Troon" that moved inland to take Glasgow. Last edited by Deeko; 15th April 2019 at 04:53. 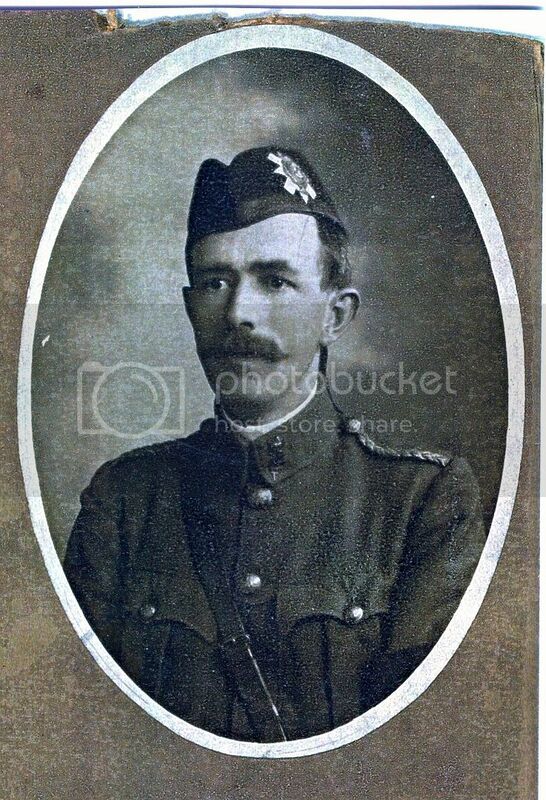 Copy of a photo of a Territorial Officer wearing small T below service dress collar badge. Not sure when the high collar tunics went out of use, or when the Ts were introduced. He joined the volunteers in 1895. He features in your post #215 in the back row third from left. Last edited by Deeko; 15th April 2019 at 04:15. Derek, thanks again for that information. His entry in Officers of the Black Watch Vol 11, MALCOLM, A. T.D (V & T.F. ); 3rd Dundee Highland Bn; Lieut. 1/8/97; Capt 2/5/00; 5th Angus & Dundee Bn; Maj. 17/7/15. Picture taken in France, CSM? wearing silver plated? 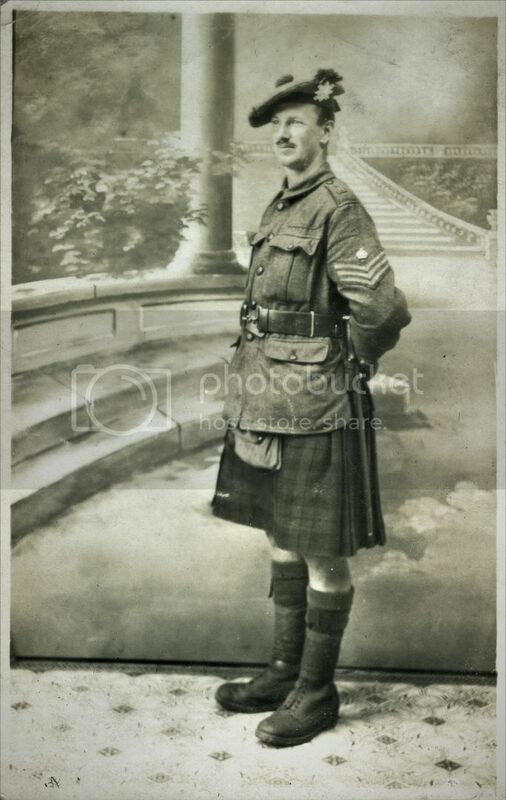 (not bi-metal) glengarry badge with backing & hackle in T-O-S.
Small RH title and an English style tunic. Looks not unlike 1167 CSM J. Dargie of B coy of the 1st Bn. This was taken in October, 1915.